Panel Discussion: "Arguing with History: Memory, Monuments, and Making Sense of the Past in an Era of Fake News"
Across the country, citizens are engaged in fierce debates about what to do with Confederate-era monuments. Some see the monuments as markers of history; others as symbols of hate and racism. 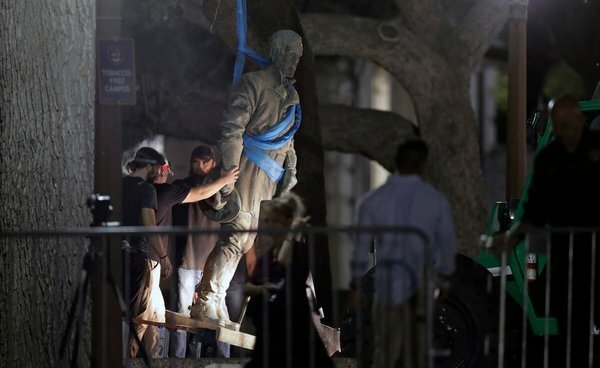 To date, monuments have been removed across the country—from Brooklyn to San Diego—and mayors and legislators are considering the removal of scores of others. In a conversation on memory and monuments with historians Ciaran Brady (Trinity College Dublin; Naughton Visiting Fellow) and Peter Onuf (Thomas Jefferson Memorial Foundation Professor emeritus, University of Virginia) to be moderated by Patrick Griffin, Madden-Hennebry Professor of History, Notre Dame, the starting point will be the question: Is the current debate over Confederate-era monuments a symptom of a steadily widening gap that has been developing as to the ways in which the purpose and character of historical writing has been conceived and understood within our public culture? One perception—operative largely within universities and research institutes—has been to accept that a necessary result of the increasing specialization of historical research is an increasing diminishment of the readership for such research. A second perception, however, has revealed a rapidly emerging sense of the relevance of historical memory and commemoration to our present sense of identity. This perception has been expressed in the marketplace through the proliferation of popular narratives concerning wars and battles, or through intimate biographies presented unashamedly in the most dramatic and uninhibitedly imaginative form. Underlying this significant cultural development, historians might ask: Has there been a conflation of the experience of the present with vicarious reconstructions of the past? If so, it is a conflation that many trained historians have found both theoretically impossible and profoundly misleading. Another question to be addressed by Professors Brady and Onuf is: Has the current cultural divergence been exacerbated by two related phenomena? One has been a fierce debate as to how Confederate-era monuments should be treated. But the second and more pervasive phenomenon has been the appearance of a radical scepticism as to the possibility of establishing an agreed body of evidence about events present and past—embodied in the cry of “fake news”—which is no less powerful because it is often uncritically and passionately asserted. Is this cognitive gap irreversible? Are the conceptions, methods and values of the professional historians now so recondite and hermetic that no one outside the profession can grasp them? And even if they were not, would such an exercise in transmission be regarded by either party as desirable? Or is it possible to find in their common concern with humanity in the past, and the self-knowledge of humanity in the present, to offer a shared moral basis for the reconstruction of a truly shared dialogue? These questions and more will be discussed by the panelists and members of the audience.